Added by Matt Gold about 1 year ago. Updated 11 months ago. I’ve exported our current Wiki in HTML format and started a blog on the Academic Commons. Generally, it seems like copying and pasting the HTML into the “text” tab works well (I had some issues with table formatting but I can play with that). The problem for us is that we have about 150 articles. We also have a number of files that are hosted by Wikispaces, most of which are linked to each of the articles. While we could copy and paste each one separately, we were wondering if there was any way that your team could upload all of the articles to our blog for us? In other words, rather than copying and pasting the HTML, your team would just add the actual HTML files to our blog, which would then appear as artcles/blog posts/whatever. We could re-add and re-link the files ourselves but it would be an incredible help if we didn’t have to manually copy and paste the HTML for each article. Thank you very much for your help! Please find attached three test HTML files. Two of the files are simple articles and one is more complicated (CAS). Here's a link to our experimental blog: https://oirawikitest.commons.gc.cuny.edu/. To begin, you should export your content to HTML and attach the generated ZIP file to this ticket. If the ZIP file is too large for Redmine, can you upload the file to Google Drive or a similar online filesharing site and pass on the link? If the wiki content has sensitive material, please check the "Private notes" checkbox when you make your reply with the ZIP file, or I can mark this ticket as private. Next, I'm thinking I can parse the HTML files locally and create the necessary WordPress posts. Once I'm done, I can export the posts into a format that WordPress will recognize, which we can then use on your oirawikitest site. Let me know if you have any follow-up questions or concerns. Thanks for your response. The files that I attached above are the exported HTML files. Since I don't want you to spend a large amount of time working on parsing the HTML files to just run a test, could you see if your method works with the three files above? Sorry for the delay. I just wrote a script to parse the HTML files. The script then creates the needed command line arguments to auto-generate the files as WordPress pages. After the pages were created, I manually exported the file to a WordPress XML file so you can run the import on your test site. I've attached that XML file to this ticket. 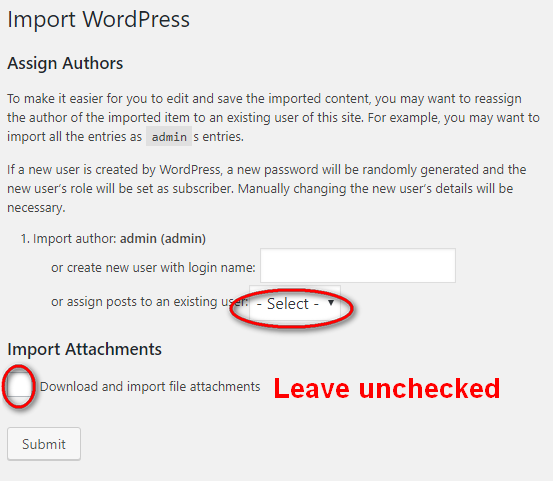 You can import this file into your test site by logging in to the WordPress admin dashboard and navigating to the "Tools > Import" page and then selecting "Run importer" under the "WordPress" heading. The one main caveat is links to internal files (such as PDFs) do not work, so you'll have to manually upload these files onto your test site and manually change the links in these pages to the new links. It might be possible for me to automate this process, but I'll need the full ZIP file in order to see what I can do. Let me know if you have any questions, or if you would prefer that I do the test import on your site for you. Thank you for your work on this, Ray! Thanks for taking care of this Ray. I was able to import the XML file. I'm aware that we'll need to figure something out for the files that were hosted by Wikispaces. It looks like the XML file added "pages" to the blog but I'm not sure how to access those pages from within the blog (they aren't listed on the left side of the page). I'm sure this is a simple tweak but can you let me know how to do that? I imported the HTML files as pages and not blog posts, because the content seemed to be more applicable as a page. As far as adding links to the pages, you can use your theme's widgets and menus to add these links. I've taken the opportunity to add the three pages from the import to the top menu, as well as adding a new "Pages" menu to the widget sidebar. All the widgets in the sidebar are configurable. Visit the WP admin dashboard and navigate to "Appearance > Widgets" to see what you can add or remove. Likewise for menus at "Appearance > Menus". Let me know what you think and how you want to proceed with the other Wikispaces content. THANK YOU! This looks fantastic! I'll demonstrate the trial site to OIRA's management and see if they want to move forward. I have an idea on how to easily keep the internal files from Wikispaces linked properly. If you need to manage files within WordPress, you would need to upload the file into WordPress first. I would recommend doing this only for new content that you add to the site. Let me know what you think when you've had a chance to discuss things over with your team. Thank you again for all of your help! We really appreciate it. We would like to move forward with using the Academic Commons as our main Wiki site. In the future, I'm also hoping that we can use the other capabilities of the site to provide further support for our office along with the campus IR offices. An OIRA Staff member (Sarah Truelsch) registered oirap.commons.gc.cuny.edu back in 2013 when OIRA was exploring other sites. Sarah deleted the site but I'm still unable to register that URL. Is there anything that you can do to free up the oirap site? Once I register it and set up our new site, I'll pass along the full export of the Wiki. Excellent, thanks guys! Ray, please let me know when the URL has been freed up so that I can register the site for the Wiki. The oirap.commons.gc.cuny.edu site was previously marked as deleted. I've just added it back and have added your Commons account as an administrator. I've also set the privacy setting so only registered Commons users can view the site and have activated the Academia theme as well, as these were the settings you were using on the oirawikitest.commons.gc.cuny.edu site. Let me know when you can provide a copy of the Wikispaces export to me. As I mentioned above, if the wiki content has sensitive material, please check the "Private notes" checkbox when you make your reply with the ZIP file, or I can mark this ticket as private. THANK YOU! Please find attached the ZIP file of our entire Wiki. A table of contents file has also been included (I'm not sure if that's helpful to you but I included it just in case it was). Please disregard the "OIRA Food and Drink / Testers" page in the ToC...that was never accessible to users so I excluded the pages from that secondary Wiki. I have completed the Wikispaces import and have attached a WordPress export file -- oirap.wordpress.2018-05-18.xml -- for use with your OIRA site. What I have done is uploaded all the Wikispaces content from the "files" directory in the ZIP file to our server and have replaced all references to the older file URLs to the new file URLs. I have also changed internal references to the older wiki links to the new WordPress URLs where possible. You can import this file the same way I list in comment 5 above. Let me know if you have any questions about how to manage or display your content on your new WordPress site. THANK YOU SO MUCH!!!! This looks ABSOLUTELY amazing! You even managed to preserve the formatting! I checked a few links to files and they look like they're all there as well. I'm going to work on exploring the WP features and cleaning up a few articles. There are 1 or 2 (MUCH smaller) Wikis that we also need to have imported. Would it be a very heavy lift for you to import those as well? I'm not sure what site they'll be on yet but what I'm thinking of doing is creating a group that will link them all together. Thanks again for everything! You've been an incredible help to us!! Glad the import worked well! It should be relatively easy for me to import other Wikispaces sites now that I've written an import script. For new imports into new Commons sites, can you create a separate support ticket? As for this ticket, I'm going to close this since the oirap import is now completed.